The Curtis Gold Cup Single Cup Brewer is like having a barista available to brew perfect cups of coffee on demand. Simply press a button and the brewer pre-rinses the paper filter and then uses pre-infusion to allow just the right amount of water into the patented brew cone for optimal extraction. The Wilbur Curtis Gold Cup Single Cup Brewer lives up to its name by allowing anyone to make Gold Cup standard coffee – one wonderful cup at a time. What is Gold Cup Coffee? Additionally, the Golden Cup Award includes the commitment to clean equipment. The Curtis CGC Brewer makes brewing a cup of Gold Cup coffee easy by allowing precise control of such crucial elements as brew time, brew temperature, and steep time. Additionally, the CGC allows for custom brew recipes for different coffee profiles. The patented brew cones are shaped to allow for precise extraction of coffee, and the filters are pre-rinsed with hot water in order to remove dust and undesirable flavors. Pre-infusion controls how much water enters the brew cones at any one time. The brewer can be used with either ground coffee or pillow packs, and coffee can be brewed into either a cup or a Chemex brewer. It can brew in 12, 16 or 20 oz. amounts on both sides. 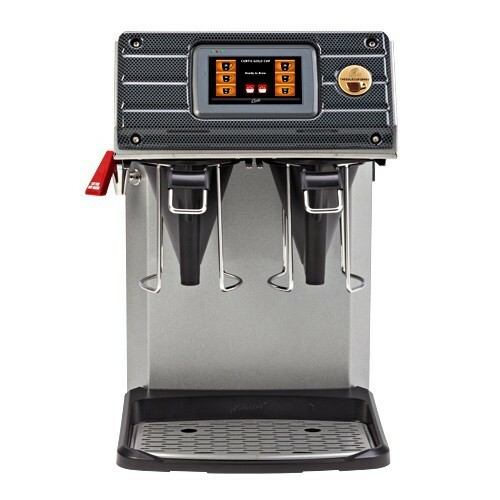 The CGC is Dual Voltage: it can brew 4.3 gallons/hour at 110V or 5.0 gallons/hour at 220V. See the Curtis video here. Want even more information about this great coffee maker, then check out the detailed Wilbur Curtis Gold Cup Single Cup Brewer Product Spec Sheet.